‘Sending three, returning two’ refers to a cyclic sequence in which one player, to avoid losing a ko, sacrifices three stones and captures two, returning to the original position and allowing his opponent a move elsewhere. The status of the game depends on the rule set in use. Black is in trouble at the top. 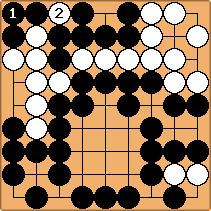 Although White's stones on the left have only two liberties, it seems Black cannot avoid White winning the two step ko in the upper left, as there are no ko threats, and White gets to take first. is the only way Black can avoid losing the ko, by sacrificing three stones. If Black were to approach on one of the marked points instead, White would capture in the corner, and Black would lose his group at the top. is, again, the only move. Black's group is in atari, so he must capture. Now, is mandatory. If White allows black to extend there, the white stones will be captured. is similarly the only move, Black cannot allow white to capture at a. After , the game has returned to its initial state, with White to move. Since White is not allowed to take the ko, White must play elsewhere or pass. After that, Black will have to start a new cycle, by sacrificing another 3 stones. Under territory scoring rules, Black is losing points with each repetition, as Black gives three prisoners, but gets only two. Under area scoring rules, the situation must be resolved by a superko rule, or similar rule preventing long cycles, or the game will go on indefinitely. Some more analysis can be found in this paper (page 24) by Robert Jasiek. Herman: I have now read the analysis on page 24, but it seems to be wrong? Please correct me if I'm wrong, but it seems to me that: In example 23, you present Cycle 1 and two variations (1.1 and 1.2). You conclude that Black cannot answer-force the cycle, because white can choose variation 1.2. But variation 1.2 is not compatible with black's strategy. Black would not pass in that position, but play one of the approach move on the left. Approaching will allow black to capture the white stones, and hence results in black's local-area-improvement. And that means, if I understand correctly, that white 2 is a mistake and black can in fact answer-force the cycle? RobertJasiek: "compatible" is a technical term (above you use it in an informal sense). - Example 23 is an example of the section Local-ko-intersection. So what is discussed is whether the marked intersections are local-ko-intersections. The term local-ko-intersection has the condition "[...] if [White...] does prevent local-area-improvement of [Black] on the cycle-set". The intersections that are considered here are exactly the marked intersections; exactly their local-area is watched; exactly they are the cycle-set of the cycle in the variation "Cycle 1". At 3 of Variation 1.2, Black may as well pass because his local-area is 4, which is the maximal possible area score on exactly the marked intersections. Black cannot answer-force the cycle in Cycle 1 because White chooses to move as in Variation 1.2: White chooses move 2 to be a pass. Before the move-sequences of Cycle 1, Variation 1.1, and Variation 1.2, the local-area was 4. After the move-sequence of Variation 1.2 (and similar variations in that White passes and Black does not commit suicide), the local-area is still 4. The local-area has not changed. In particular, it has not improved for Black. Black has not got local-area-improvement on those marked intersections. Therefore, by choosing Variation 1.2, White prevents Black's local-area-improvement if the start-position is the current-position. To show that the marked intersections are local-ko-intersections, one should use a different start-position: the one of Cycle 2. - If Black tries to improve on Variation 1.2 by capturing the nearby white string, this does not improve the local-area of the marked intersections. - If we tried a different analysis and marked also the intersections of the nearby white string, then Black could not force a cycle with any of those additional intersections in the cycle-set; so that kind of proof construction for Example 23 would also be in vain. - If you want to consider score on all intersections, you need to test for global-ko-intersection. This I have not done in the paper, version 7 (yet). Have fun (dis)proving for some komi and player having the turn whether there are any global-ko-intersections in the position! Herman: Adapted from a recent game of mine. is necessary. If white plays a, black plays at and the position will be seki, so white will lose. After , a cycle of length five has occurred (compare the first diagram). white has no move now, but if white passes, then black can pass and under some rules a dispute may occur. If white does play a move (costing a point), then black will repeat the cycle. This can continue until there are no more viable moves for white. At which point white will be forced to pass. Note that black will never have time to play a, because he must force the cycle or lose the fight. The position has some similarity to moonshine life. unkx80: Interesting position. Under certain rules such as superko rules, isn't prohibited? ThorAvaTahr: see cycle, the position fits the cycle of five herman has been looking for. Actually regardless the rule set white will win in this position since there are no ko-threats, even if the cycle was allowed it costs one point every time he carries out the cycle. IMO you can promote this position to the cycle page, I can find no flaw. Nice job! Bill: Very nice position! :) Different rules treat this differently. Under AGA rules and New Zealand rules Black can repeat the position because it does not repeat the situation, as the player to move is different. Then after White's pass Black can pass, ending play. Under Ing rules I think that this would be deemed a disturbing ko, and White could eventually take the Black stones. Taking this as the final position, the stones are dead, because White can capture them in ko. The stones are also dead. The scoring is interesting. Because of the two dame ( ) in the top left corner, the adjacent White stones are in seki, and so the dead Black stones cannot be removed. (Dead stones can only be removed from territory.) The same goes for the dead White stones in the bottom right corner. The main Black stones are also in seki. The Japanese rules are not all that clear about what it means for a stone to have dame, and thus be in seki, as some stones that are not adjacent to neutral points are said to be in seki. I think that the correct interpretation is that all of the stones on the board are in seki, except the White group in the top right. (See the Spight Japanese style rules for my interpretation.) White has 3 points of territory and has captured 3 stones and Black has captured 2 stones, so White is ahead by 4 points plus komi, if any. Under Spight Japanese style rules Black can play sending three returning two to repeat the position and then White passes, then if Black repeats the position again the round ends and play stops. Then play starts again in the encore with White to play without any ko ban. So White can take the ko.